ENTERTAIN and INFORM your guests from the minute your gates open to the minute your airshow ends by hiring this dynamic announcing team. Roy Hafeli, ICAS member, Honourary Snowbird and seasoned airshow announcer, and Ken Hildebrandt, ICAS member, theatre producer, actor and private pilot, are pleased to provide a unique announcing package that will keep your guests entertained and informed throughout the day. While one of the announcers attends your all-important performer's briefing, the other will be on air the minute your gates open, informing your guests about all the exciting activities, displays and concessions your guests can enjoy through-out the airshow day. 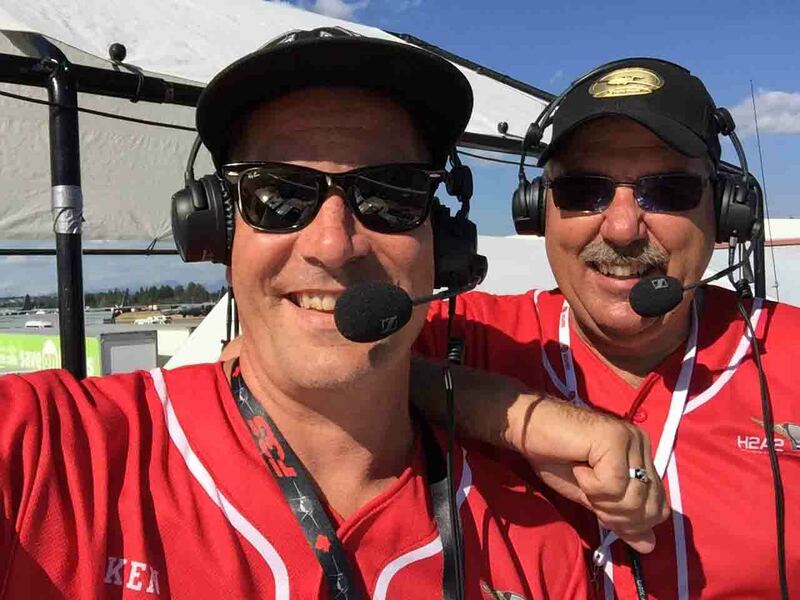 During this entertaining morning show, either Roy or Ken will conduct live interviews with static display participants, giving your audience a unique look in to the military, commercial and home-built aircraft that adorn your airshow grounds. Your sponsors, vendors and corporate clients will also receive extra exposure during the morning show, ensuring their continued support of your airshow year after year. Once the flying show begins, both Roy & Ken take to the air with their enthusiastic voices and entertaining, easy going airshow commentary, putting airshow fans right in to the cockpit as the pilots fly their amazing machines through intricate routines and exciting flying displays. Having H2A2 Airshow Announcers for your next show will provide you with a dynamic and unique airshow announcing experience that is entertaining AND informative. Book your complete announcing package today.